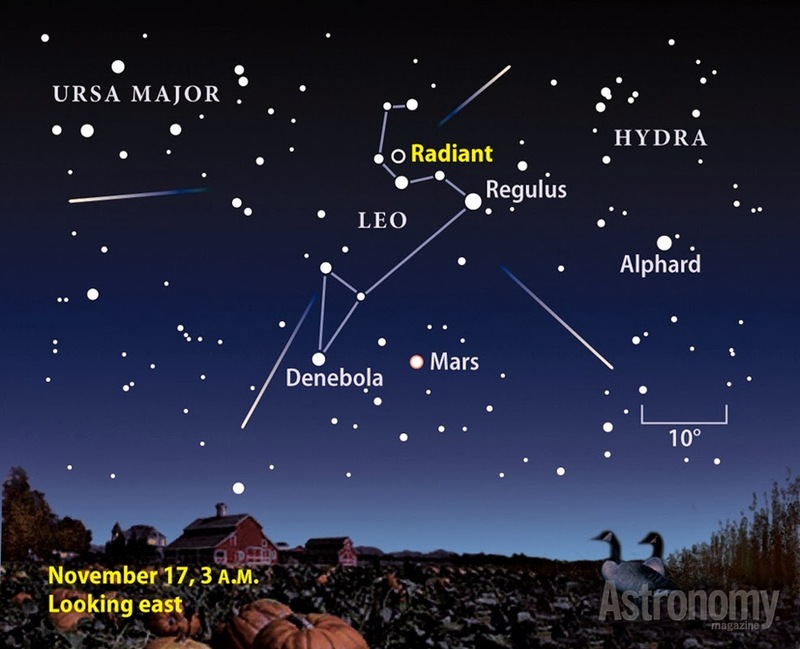 We have two meteor showers coming up this November. Meteor showers are always a spectacular sight and a reminder of how incredible this Mother Earth on which we dwell is. "Shooting stars" and "falling stars" are both names that describe meteors -- streaks of light across the night sky caused by small bits of interplanetary rock and debris called meteoroids vaporizing high in Earth's upper atmosphere. When a meteor appears, it seems to "shoot" quickly across the sky, and its small size and intense brightness makes it look like a star shooting across the sky. If you're lucky enough to spot a meteorite (a meteor that makes it all the way to the ground), and see where it hits, it's easy to think you just saw a star "fall." It is said to be very lucky to actually see a meteorite land. Hence the song ‘catch a falling star and put it in your pocket. You may not be able to catch a falling star, but you can enjoy the amazing experience, put it in your pocket and save it for a rainy day! The South Taurid meteors are happening right now. 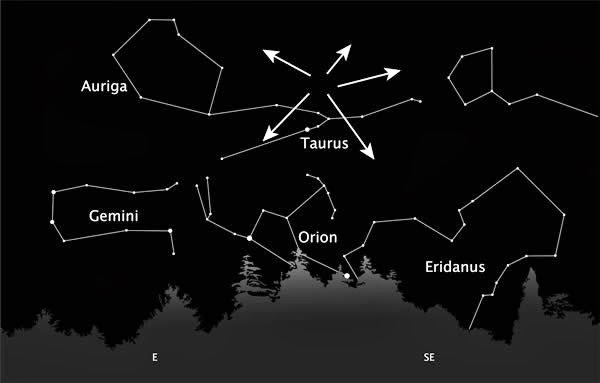 This meteor show originates from the constellation Taurus. These meteors are quite spread out with only about 7 meteors expected per hour. The Taurids are, however, well known for having a high percentage of fireballs, or exceptionally bright meteors. So well worth spending an hour or two gazing at the sky to catch sight of a spectacuar fire ball! Coming up next week we have the North Taurids, these meteors should be visible from late night November 11 2013 until dawn on November 12th. Like the South Taurids these meteors are not particularly frequent with again approximately 7 per hour. 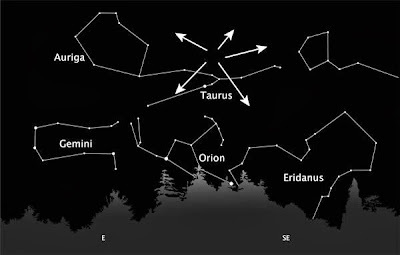 Typically, you see the maximum numbers at around midnight, when Taurus the Bull is highest in the sky. Taurid meteors tend to be slow-moving, so plenty of time to catch sight of these particularly bright meteors. The best time for viewing will be after the moon has set after midnight as it will be a waxing gibbous moon by then so the brightness will make viewing more difficult. Hard on the heels of the Taurids come the Leonids from late November 16th until dawn on November 17th. 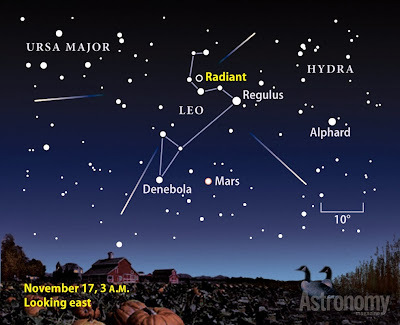 The Leonids radiate from the constellation Leo the Lion. The source of the meteor sis Comet Tempel-Tuttle, which is falling apart as it makes periodic runs around the sun and its ices melt from the heat. The famous Leonid meteor shower has produced some of the greatest meteor storms in history – at least one in living memory, 1966 – with rates as high as thousands of meteors per minute during a span of 15 minutes on the morning of November 17, 1966. Can you imagine that? It is said that the meteors were falling like rain! Some who witnessed the 1966 Leonid meteor storm said they felt as if they needed to grip the ground, so strong was the impression of Earth plowing along through space, through the meteoroid stream. For best viewing of meteors it is better to go where there is not too much surrounding light. 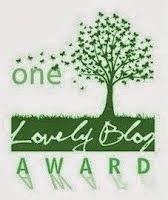 If you can escape to the countryside or a park then your viewing will be much better. I like to watch meteors flat on my back, then you really get a sense of being gounded on our earth whilst watching this spectacular show happening in our heavens. Watching meteors can be a deeply spiritual and uplifting experience. Beautiful..looking forward to all of this starry magic..thanks or all the wonderful info!